JUNEAU, Alaska— Alaska’s seasonally adjusted unemployment rate was 6.6 percent in April, unchanged from the previous month. The comparable U.S. rate was 5.0 percent. The state’s adjusted rate has held steady at 6.6 percent since October of last year. This suggests that the impacts of job losses in the oil and gas industry and state government have not yet spread through the broader economy. April’s unadjusted rate was 6.9 percent, down four-tenths of a percentage point from March’s 7.3 percent. This is a typical seasonal decrease in the unadjusted rate as Alaska’s economy gears up for summer construction, fishing and tourism. 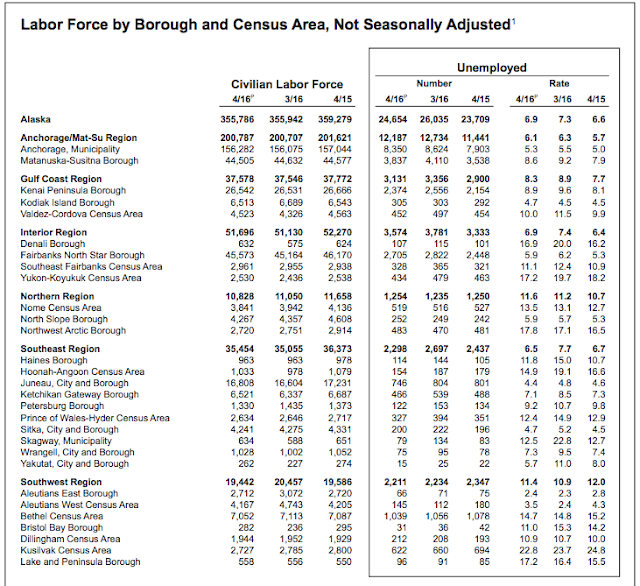 Around the state, unadjusted unemployment rates fell in most boroughs and census areas in April. The eight areas where rates rose were in the southwest and northern parts of the state that have different seasonal patterns due to winter groundfish fisheries and construction. Preliminary estimates of Alaska’s April job counts show a loss of 2,500 jobs from the same month in 2015, driven by large declines in oil and gas industry and state government employment. Employment levels in the construction and professional and business services sectors also shrank, likely due to oil-related cuts. Losses were partially offset by job growth in the health care and retail sectors.